The global energy problem is the problem of providing humanity with fuel now and in the foreseeable future. Here are the ways to solve this problem with an unexpectedly different approach. Every hour the earth receives more solar energy than Earthmen use for a whole year. One way to use it is to create orbital solar farms that will collect some of the high-intensity and uninterrupted solar radiation. Huge mirrors will reflect the sun's rays on the collector of a smaller size. Then this energy will be transmitted to the ground by means of microwave or laser beams. One of the reasons why this project is at the idea stage is its huge cost. Nevertheless, it can become a reality in the near future because of the development of technologies and the reduction in the cost of exporting goods to outer space. We already have a human-charged device, but scientists are working on how to get energy from a usual movement. It's about microelectronics, but the potential is great for a target audience of a billion people. Curbing all the energy of the ocean could charge the whole world several times, so more than 100 companies are working on this. Because of the emphasis on the energy of the sun and wind energy, tidal one was forced out of the front rows, but it becomes more efficient currently. Hydrogen, the most common element in the universe, contains a lot of energy, although the engine that burns pure hydrogen produces virtually no emissions. After separation, hydrogen can be pumped into mobile fuel cells and placed on cars for direct generation of electricity. These cars are now produced in fairly large lots and a case study on this matter can be ordered here https://essaylab.com/pay_for_papers_written. The way to convert heat into electrical energy that rises from the molten depths of the earth is used for the needs of millions of houses around the world and in the mathematical language is a torque equation. Its geothermal energy. It accounts for 27% of the generated energy of the Philippines and 30% of Iceland. Nuclear power plants are traditional nuclear reactors that have been in use for decades, being responsible for 20% of the energy consumed in the United States. But now we have a more efficient technology of fast reactors, where the rods are immersed not in water, but in liquid sodium. Thanks to this, 95% of uranium is used, instead of an unacceptably low efficiency of 5%. This method will solve a huge problem of getting rid of radioactive waste since these reactors can use them repeatedly. Every day the production and installation of solar cells are becoming cheaper, which leads to their widespread distribution. Europe led by Germany is the leader in converting the energy of the sun into electricity. Researchers from the National Laboratory of Spain have made a significant breakthrough in the technology of photocells at quantum dots, which will allow highly efficient solar panels to work as transparent glass. When this technology becomes cheap enough to enter the mass market, any sunlit window can be turned into a miniature solar station. Today biofuels are winning their positions. The only drawback is that the first generation of biofuels uses the same land and resources that used to grow food, which raises prices for it and causes many problems in the developing world. This brings us to the third generation of biofuels - algae, which can replace oil once and for all. The natural algal oil content is more than 50%, which guarantees easy extraction and processing of the oil. The remains of the plant can be turned into natural gas or fertilizers to grow even more algae without chemicals. 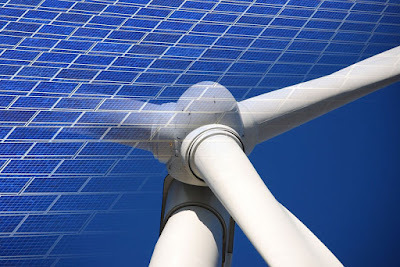 Even today we get enough energy from the wind, but thanks to the hanging wind turbine above the ground, where the wind is stronger and more stable we could get it much more efficiently. The scheme is simple. It is a soft circular airship tied to the ground with a turbine in the middle that will produce a double amount of energy as a stationary windmill of the same size. Unlike nuclear fission, nuclear fusion does not produce any deadly nuclear waste, since it merges the atoms together, rather than splits them. Consequently, there is no threat of uncontrolled reaction, which can lead to melting of the active region of the reactor. However, it is easier said than done.